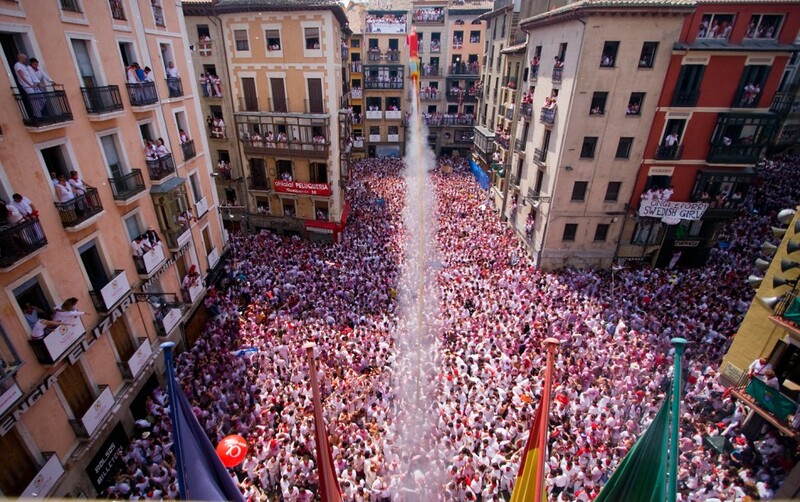 Pamplona celebrates its famous festivities “San Fermin” from the 6- 14 of July. Those days the city is deeply transformed into an explosion of life. Thousands of people dressed in red and white from all over the world enjoy nine days of non stop fiesta with music, joy and an atmosphere of fraternity flooding the streets. Pamplona is a city of roughly 200,000 inhabitants but on those days it receives up to 1000,000 people. That’s why it is so important to make your booking in advance. Our hostel is strategically located in order to fully live the “fiesta” without forgetting how important it is to find a quiet place in which to rest. We offer you the ideal place to have a break. // 6th July. Start of San Fermin. © PATXI URIZ. Photo courtesy of Departamento de Turismo del Gobierno de Navarra. During San Fermin our prices are changed. You can contact us to book. There’s no breakfast service during San Fermin. Check in must be at 2pm, although there’s no problem to leave your packcage in the hostel if you arrive before. Check out must be before 12am. via credit card for the total amount. In case of cancellation the money will not be refunded.